ISLAMABAD: The accountability court on Friday sentenced deposed prime minister Nawaz Sharif to 10 years rigorous imprisonment for accumulating assets beyond income and one year for non-cooperation with NAB [National Accountability Bureau] in the Avenfield reference — both sentences will run concurrently. Corruption charges, however, could not be proved against Nawaz, according to the verdict. Nawaz’s daughter, Maryam, has been handed a seven-year jail term for abetment in the purchase of the posh property in London, and one year for non-cooperation with the accountability watchdog–sentences will be concurrent. According to the verdict, she “aided, assisted, abetted, attempted and acted in conspiracy with her father”. “The trust deeds produced by the accused Maryam Nawaz were also found bogus,” read the judgement. Maryam’s husband, Captain (r) Safdar Awan has been sentenced to a year’s rigorous imprisonment for not cooperating with the NAB authorities. Besides imprisonment, the NAB court has also imposed a fine of 8 million pounds on Nawaz and 2 million pounds on Maryam. However, no fine has been imposed on Safdar. The money will be submitted to the national treasury. Moreover, Maryam and Capt (r) Safdar can no longer contest the upcoming general elections. They, however, have the right to appeal against the verdict. Maryam’s name will be removed from the ballot papers of the NA-127 constituency, said the Election Commission of Pakistan (ECP) following the ruling. Nawaz’s absconding sons, Hasan and Hussain, have not been convicted owing to their repeated absences from the hearings. “Hasan and Hussain Nawaz are absconding therefore, they are declared as proclaimed offenders. Non bailable perpetual warrants of arrest shall be issued against them,” reads the verdict. The father-daughter duo and Safdar have only 10 days to file an appeal in the case. Meanwhile, a team of NAB Lahore has obtained arrest warrants from the accountability court to arrest the Sharifs as soon as they land in Pakistan in line with the court orders. Moreover, NAB will again request the Ministry of Interior to place their names on the Exit Control List (ECL). According to NAB prosecutor Muzaffar Abbas, the court also ordered the seizure of the Avenfield flats in question by the federal government. Hours after the verdict, Nawaz, flanked by Maryam Nawaz, held a presser in London wherein he vowed to come back to the country and face jail once his wife Kulsoom regains consciousness. A visibly shaken Nawaz, though in a defiance tone, said that he would continue his struggle against the ‘slavery’ imposed on Pakistanis by some “judges and generals”. “The kind of struggle I have started such verdicts are expected,” the former premier bemoaned. He lamented that the country has a history of sending prime ministers home on one accusation or the other. He urged the people to join his struggle for the supremacy of the ballot. The PML-N leader also expressed concern over increased censorship of media, newspapers and journalists. “I haven’t read the judgement but according to media reports the prosecution failed to prove any corruption charges me,” he said. Things are not much bright for the Sharifs as they need to surrender before the court first before they can file an appeal in the high court. The second course is that they boycott the proceedings all together, which is very unlikely. But Nawaz and Maryam have to come back as the fate of their party, Pakistan Muslim League-Nawaz (PML-N), in the general elections depends on their return. Though, the case was already in the spotlight and Sharifs and the PML-N, beside other things, had made the case much controversial, an unexpected delay in the announcement of the verdict on Friday raised many eyebrows. “It is unusual and such delays of half an hour, two hours don’t happen,” senior lawyer Saroop Ijaz told Pakistan Today. At the outset of the hearing, the accountability court had dismissed the petition filed by Nawaz Sharif and Maryam, praying upon the court to delay the verdict in the Avenfield reference and grant a seven-day exemption. After setting three deadlines for the verdict— 3pm, 2:30pm and 12:30pm — the court said it would announce the verdict at 3:30pm; however, the decision was delayed again till 4:20pm. According to reports, the decision was delayed due to the ‘printing of 400 copies of the judgement’. Before the judgement was announced, the judge called lawyers of both sides inside his chambers while barring the media persons. Strict security arrangements, including paramilitary personnel, were deployed at the Federal Judicial Complex, where the NAB court is located. The roads leading to the complex had also been closed to traffic. Moreover, the district administration had imposed Section 144 in the federal capital to discourage mass gatherings. The ousted premier and his daughter had filed an application with a duty judge on Thursday seeking a seven-day delay in the verdict announcement in light of Kulsoom Nawaz’s health. The Sharif matriarch has been in London since last year, when she was diagnosed with cancer. She was recently placed on a ventilator and her condition remains more or less unchanged. 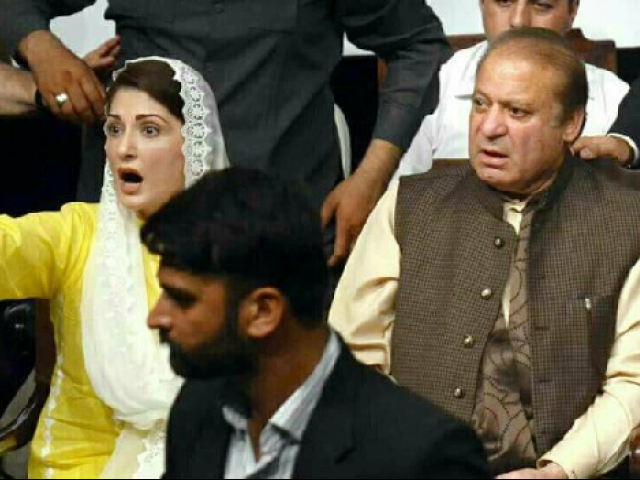 Receiving Nawaz and Maryam’s application on Thursday, duty judge Mohammad Arshad had issued notices to the prosecution wing of NAB, and left it up to Judge Bashir to decide on the application. Subsequently, the court reserved its decision on the application for an hour, until 11am. At 11am, the court announced that it had rejected the application and the verdict would be announced at 12:30pm. Earlier, the court had reserved its judgement in the case after almost 10 months of proceedings and roughly 80 plus appearances of the former prime minister, his daughter and son-in-law.